The environment provides rich material for artists these days, especially in the many ways humans have tried to structure it, and the relationship of human structures to the natural world. 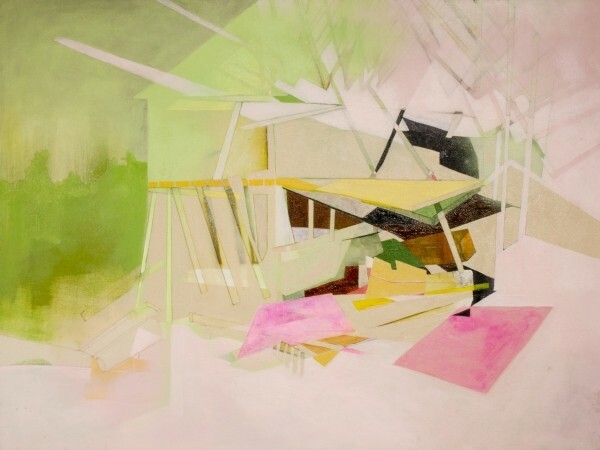 In the latest exhibit at the Projects Gallery (formerly Locals Only) at the Utah Museum of Contemporary Art, Andrea Jensen’s mixed-media paintings look at building forms in flux amid forces of decay and degradation. Her choice of materials is intriguing, as it also comments on the theme. “I like to use pieces of found materials to reference our surroundings,” Jensen says. “Our relationship to others manifests itself in our interaction with the environment. This relationship with our environment is what I would like to confront through my work.” In the painting “Something Destroyed, Something New,” for example, the implication is that destruction is the first step in the process of renewal, or rebirth. The color palette in her paintings—full of bright, sometimes primary shades—is emotionally vibrant and evocative of the world of nature, yet its contrasts also evoke conflict, the broad sweeps of nature’s brush, especially in tandem with her sometimes jagged lines. The Projects Gallery exhibition space, on the upper level of UMOCA, was, from its inception in 2011, designed specifically to showcase work by artists working in Utah. It has not only provided a number of local artists with exposure to a wider audience, but also helped the museum address themes that strike a chord locally.